While driving up the Southern California Coast, I came upon this scene. We pulled over and climbed down. I climbed up on a comfy rock, dug out my Bible, the Oct/Nov issue of Discipleship Journal and my notebook. The DJ Study Guide for Oct/Nov is “How to Study an Aspect of God’s Character,” & I had been dragging it along on my trip, studying a different aspect each day. I thought the scene before me, pictured above, was perfect for that day’s aspect: Mighty God. 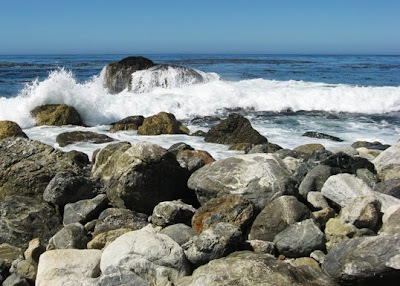 Nothing says “Mighty God” better than harsh water beating against steadfast rocks! I wanted to start grunting with power like Tim the Toolman Taylor. He made a way for us to be blameless and holy before Him, through Christ. He freely gives us His grace, through Christ. He freely gives us His forgiveness, through Christ. He freely gives us wisdom and understanding, through Christ. Read Ephesians 1:1-23. Verses 15-18, especially, are my prayer for you today. May you abound in grace and forgiveness and be wrapped in His love today.